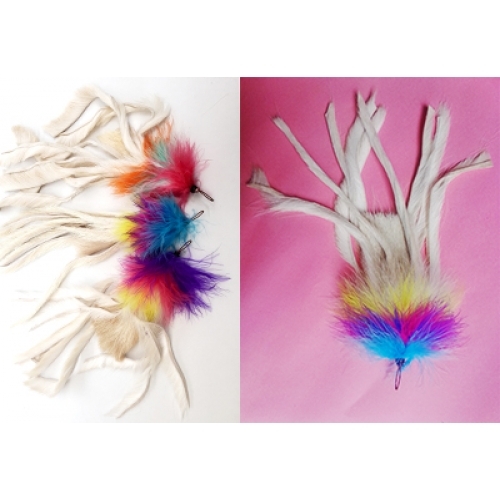 The Jellyfish refill is made of colouful fluffy turkey marabou feathers and 8 white/cream natural deer hair tail strips. These really are about as good as it gets, the Purrs Jellyfish refill really brings out the natural hunting instinct of your furkid. Cats go completely PurrCrazy for this refill! 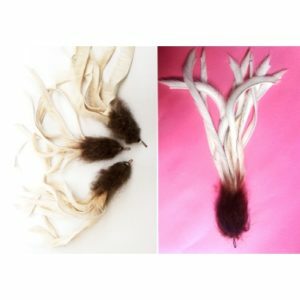 The Jellyfish refill is made of colouful fluffy turkey marabou feathers and 8 white/cream natural deer hair tail strips. The deer hair strips are a by-product from free roaming, outdoor reared herds leading a natural life before entering UK food chain and are protected under British Animal Welfare Laws and The British Deer Society (BDS). Individually Handmade. Made with the hair fixed to a plastic core (No sharp metal bar!) The connection to the wand toy is via a front strong braided cord hook. Approximately 30cmm long from hook to deer hair tail ends. Various coloured feathers & natural white/cream deer hair strips. Please note – The white deer hair tails are completely natural and so it is to be expected that some hairs will become detached or ripped from the leather strips during play.